Cover of a matchbox produced in 1985, celebrating 75 years since the formation of the Baker Perkins Sports & Social Club. 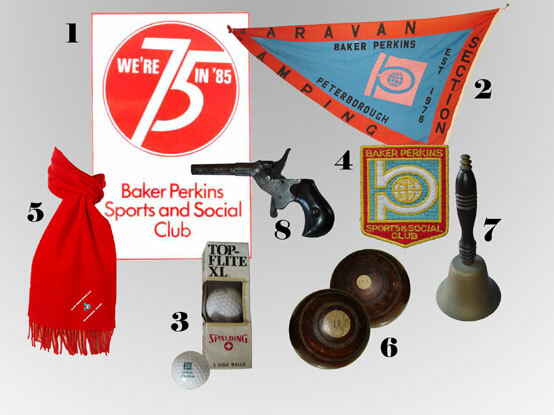 Pennant from the Camping & Caravan section of the Baker Perkins Sports & Social Club. Golf balls embossed with the Baker Perkins logo. Set of Bowling Woods – Many of these sets were owned by the Bowls Section and were available for use by Sports Club members – particularly during the many Inter-Departmental Competitions. The bell that was used to call “Time” at the Baker Perkins Sports Club bar in Alma Road, Peterborough. This starting pistol was probably used at the Sports Club Open Day races held on the Alma Road Sports Ground. Thought to be of German origin, it bears the letters – DRGM.